ESA, now part of Capita Symonds, has unveiled pictures of Stryker UK’s new flagship office in Newbury. Stryker is a global leader in medical technology providing specialist orthopaedic and surgical equipment to healthcare professionals across the world including the NHS. The company has just completed its move to the new offices which will house 200 staff. 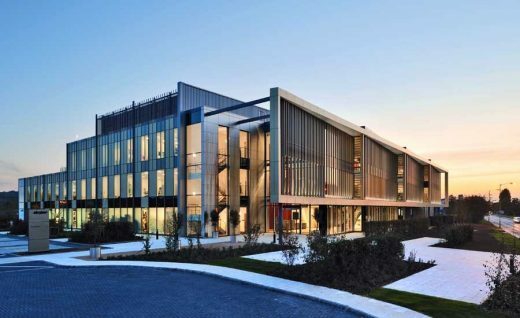 Stryker’s nearby previous building was a combination of offices and logistics space extending to around 4,650sqm of floor area in a 25 year old facility which was not suited to the company’s aspirations. The new building provides adequate office floor space for current and future needs, as well as doubling the size of the company’s all-important logistics facility, while also creating a building of quality that visually expresses the company’s corporate intentions. ESA was originally appointed in 2008 to develop design proposals and, ultimately, gain planning consent. They were then appointed as architects, interior designers/spaceplanners and landscape architects to the project. 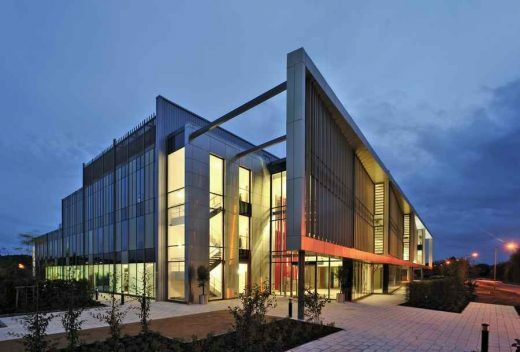 The new building is to the east of Newbury and is well connected via main line rail to London and the west of England. The building will continue Stryker’s long-standing relationship Newbury as one of the town’s major employers. The new 10,000sqm facility rises to three storeys and is organised around two internal atria that focus the public facilities of reception, exhibition space and the new 100-cover first floor restaurant for staff and visitors. The plan form – whilst responding to a generic ‘BCO’ standard office shape (1.5M space-planning module; maximum 18M deep wings; 2.8M headroom; fairly conventional servicing distribution) – also derives from the functional and operational requirements established by the client’s brief. A tiered series of building wings unified by the enclosed three-storey circulation and break-out space facing on to the approach road emerged as the optimum plan solution that synthesised the client’s requirements. All the logistics facilities – medical equipment centre, sterilising plants and technical workshops – are at ground floor for ease of access and movement, with a mixture of cellular and open-plan offices, meeting rooms, conference rooms, restaurant and a gym on the upper floors. The main approach elevation is expressed as a transparent ‘showcase’ screen, unifying the space and functions behind whilst allowing visual access into the building and expressing Stryker’s corporate intentions. ESA’s brief included the design of the interiors and the selection of all the furniture and fittings – a full ‘Cat A and Cat B’ service. A detailed analysis of Stryker’s work methods and workplace requirements preceded the developing concept. 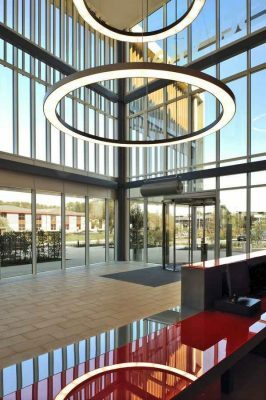 For many years now Stryker has consistently been at the top of various “best employer” league tables and this is reflected in the attention the company pays to the staff working environment and welfare facilities within the new building. 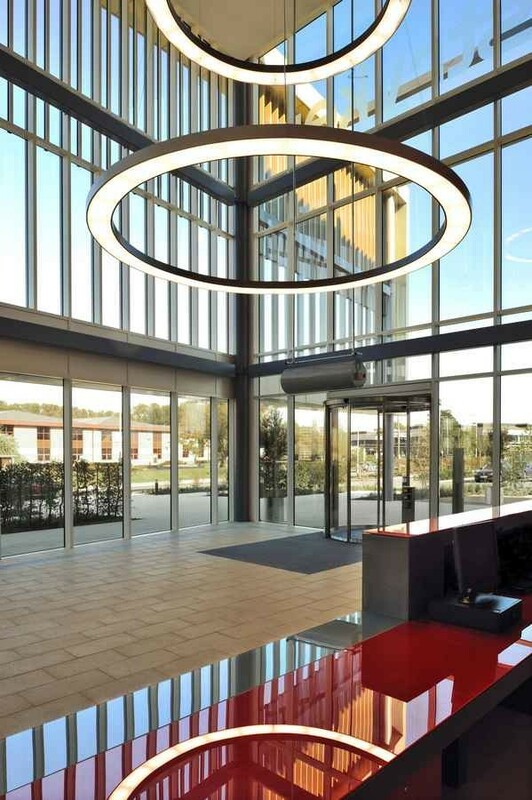 ESA has risen to this challenge by providing comfortable offices and exhilarating common areas including reception, the exhibition areas and break-out spaces. The building has achieved an “Excellent” BREEAM rating and incorporates alternative energy systems such as a biomass boiler to reduce carbon emissions. Externally the new building sits within its own landscaped grounds with parking for 230 cars and rear servicing to the logistics areas. About Capita Symonds – www.capitasymonds.co.uk Capita Symonds is one of the UK’s largest and most diverse multidisciplinary consultancies operating in the building design, real estate, civil engineering, environment, management and transport sectors. With over 4000 staff in over 60 UK and international offices we offer an unrivalled scope of services and a unique blend of professional and technical skills to schemes of all types and complexities. The new building overlooks Virginia Water, an extensive man-made lake set in a picturesque eighteenth century landscape, sitting within the Grade 1 listed Royal Landscape at the southwest corner of Windsor Great Park.